Colonial women had few clothes. Generally, a work or day-time) dress, apron and a dress for special occasions was the standard. There were no closets and clothes were kept neatly folded inside of a chest. New clothes were made by making a pattern of the old dress and duplicating it. Women had to spin the cloth, then hand-stitch the item. The hairdo was kept in place by sleeping on a wooden bolster (under the neck). Try that one for your vertabrae! Despite what the movies depict of the days on the plantation, the days were filled with chores and responsibilties, not only for the household, but for the servants as well. Although the mistress of the home usually managed a small household staff, she dispensed all of the medicine and acted as a nurse. She had to teach servants the most rudimentary chores, such as sewing. Oftentimes, there was not a girl available to be the household seamstress, so the mistress made clothes for her own children as well as for the servants. That was a daunting task, ladies! 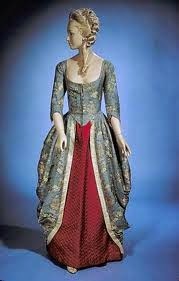 The glamorous costumes were mostly worn from titled English ladies or the colonial governor's wife.